Epta - thanoscardgamess jimdo page! This is a plain trick taking game with bidding that I was told it is played in the island of Mytilene, Greece. 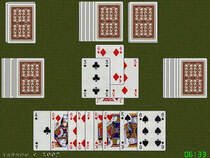 There are four players in partnerships of two and a standard 52 card pack is used, each suit ranking in the usual way from ace (high) down to two (low). A bid consists of a number of tricks (from 7 to 13). Each site's objective is to take at least the number of tricks that they bid, and if possible to hinder the other players from doing so.